In the summer of 1982, Neil Smith appeared in a made-for-TV movie called Rage of Angels as a member of the New York Rangers. It's summertime, and the living is easy for most hockey players who are pursuing interests away from the rink. But there are some who spend time at hockey camps, and there is the rare occasion when a Hollywood producer stops by and asks for players to appear in a made-for-TV movie. That is exactly what happened to Neil Smith in the summer of 1982, as the producers for the movie based on Sidney Sheldon's novel Rage of Angels decided they wanted a scene which featured the lead characters at a Rangers-Islanders game. The Islanders' hockey camp was taking place, and the producers asked Smith and others who were around to recreate a hockey scene which involved a skirmish in front of the net of Islanders goalie Billy Smith as actress Jaclyn Smith and actor Armand Assante watched from the stands. The two cast members were involved in a love story and were supposed to be at a Rangers-Islanders game. "We were in the Nassau Coliseum, and they made me a Ranger and at the time. I was with the Islanders (as a scout) and that was the part I really remember the most," Neil Smith said of his experience. "Billy Smith had to knock me out. I just remember he almost knocked my shoulder out." Neil Smith was just working his summer job teaching youngsters how to play hockey when the bright lights of Hollywood called. "Just because I was hanging out at Nassau Coliseum," Smith said of how he ended up in a movie. "Rich Torrey and I, Bill's son (Islanders General Manager Bill Torrey and architect of at that time of three straight Stanley Cup championships) got the other role as a Ranger player, and I think there was Billy Smith and one other guy playing Islanders. I just think because we were around there and they needed to use the Nassau Coliseum, they needed some people to pose as hockey players." Billy Smith was well known for his combative nature when he was in net, and apparently Robert L. Joseph, who wrote the teleplay for the movie, was aware of Smith's on-ice reputation and the script was pretty authentic when it came to the hockey scene. "It wasn't a stretch back then because that is how he used to play," Neil Smith said with a chuckle. "He always laughs because he knocked my shoulder out when he did it. He still laughs." Neil Smith didn't remember how many takes director Buzz Kulik wanted for the scene, just that his shoulder was injured. But in Hollywood, the show must go on, both in the movies and on ice, so Neil Smith, Billy Smith and Jaclyn Smith got through the scene even though Neil Smith was injured. "I was just a little bit player but I still get a check for 15 cents every few months or 10 cents or eight cents as a residual," he said of his brief movie experience. "Now I know how these movie stars make money. They must be paid big money over and over and over again." There were three Smiths in the movie, but Neil Smith is certain that the producers got the Smith problem straightened out when it comes to the residual checks. At least they never confused him with Jaclyn Smith. "I think her checks are a little bigger than 10 cents every few months," said Neil Smith. "But it was exciting meeting her at the time"
Looking back a quarter of a century, Rage of Angels got one thing right. 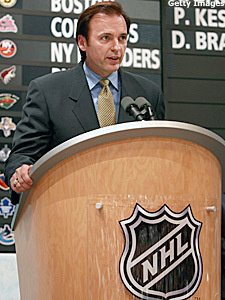 Smith would ultimately become a Ranger as he became the team's general manager in 1989 and would assemble the 1994 Stanley Cup champions, ending the Rangers' 54-year drought between Cups. There was a sequel to the 1983 TV movie made in 1986, Rage of Angels: The Story Continues, but there was no hockey scene in the sequel. Smith left his movie career behind and left the Islanders and moved on to Detroit where he got a higher-ranking post. Among his jobs was to run the AHL's Adirondack Red Wings. In 1986 and 1989, Smith's Red Wings won the Calder Cup as AHL Champions. But if Smith wants to ever resume his movie career, there could be a role somewhere for him in another movie that would be perfect typecasting. Smith owns the ECHL's Johnstown Chiefs, and Johnstown, Pa., served as the home of the Federal League's Charlestown Chiefs in the cult classic Slap Shot. Smith's Chiefs don't shy away at all from its movie heritage and play at the Cambria County War Memorial Arena, where a good portion of the movie was shot. There is a third installment of the hockey movie franchise, Slap Shot: The Junior League, that will be released straight to DVD sometime this summer. Neil Smith isn't in that one, although one of his key players from the 1994 Stanley Cup champions -- Mark Messier -- has a cameo.